Butter clams dug up on a sandy Calvert Island beach. Note the slight gape at the posterior end in the top right photo. Photos by Jessica Brown (top left), Thalia Christou (bottom left), and Chanda Brietzke. The butter clam has a large (to 15 cm) square- or oval-shaped white to grey shell. The shell only has concentric ridges running parallel to the shell edges (no radial ridges). The shell gapes slightly at the posterior end (click here for information on shell orientation). The interior of the shell is strongly marked by two muscle scars on each valve. The butter clam buries in sand, mud, and gravel sediment to 30 cm deep. It is found in sheltered locations such as bays, from the mid- to low intertidal to a depth of 40 m. Its range extends from the Aleutian Islands and the southeast Bering Sea to southern California. It is a common species and can be found in large populations. 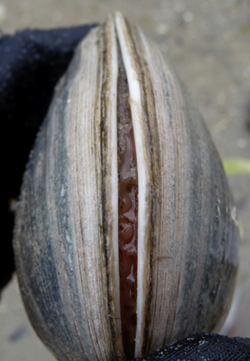 Other whitish clams without radial ridges include the gaper clam (Tresus capax) and the softshell clam (Mya arenaria), both of which have large chondrophores (which the butter clam lacks). 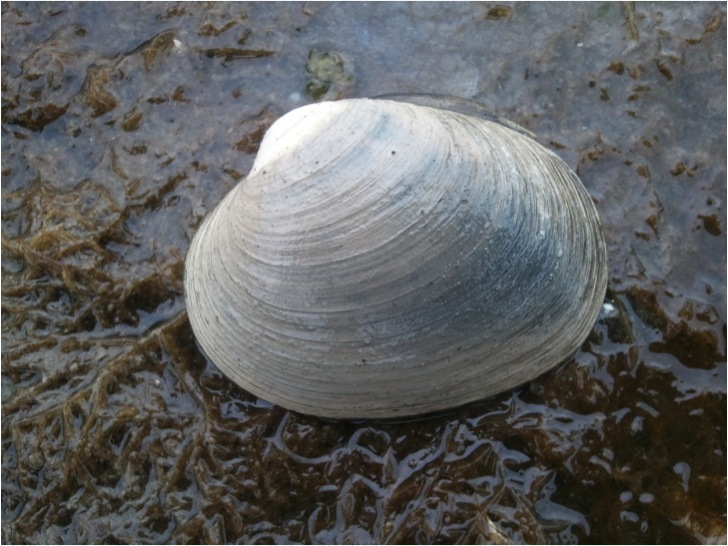 The butter clam is edible, and is considered ideal for chowder. Caution must be exercised when harvesting, however, as this species is especially prone to PSP (paralytic shellfish poisoning). PSP accumulates most in the black siphon ends, and so even when there is no red tide warning harvesters should remove this portion before consuming. 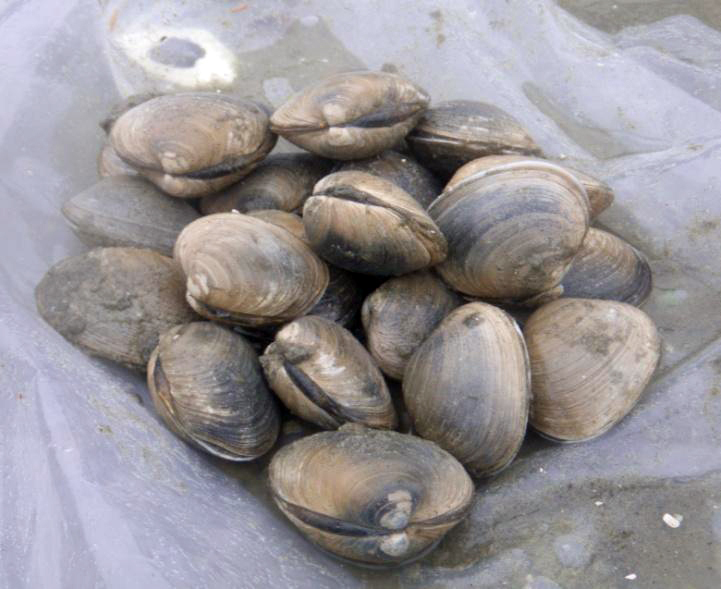 Red tide warnings should be heeded, as PSP can persist in the clam's tissues for months. 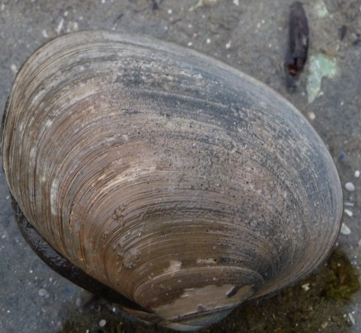 The butter clam grows faster in southern locations; it grows to minimum legal size for harvest (6 cm) in 4-5 years in southern locations, and 8-9 years in more northern areas. Cowles, D. (2005). Saxidomus gigantea Deshayes, 1839. Invertebrates of the Salish Sea. Rosario Beach Marine Laboratory. Accessed 02/09/2014. Harbo, R. M. (1999). Whelks to whales: Coastal marine life of the Pacific Northwest. Madeira Park, BC: Harbour Publishing. P. 97.